Goodnight Boutique’s 1st Birthday Party! 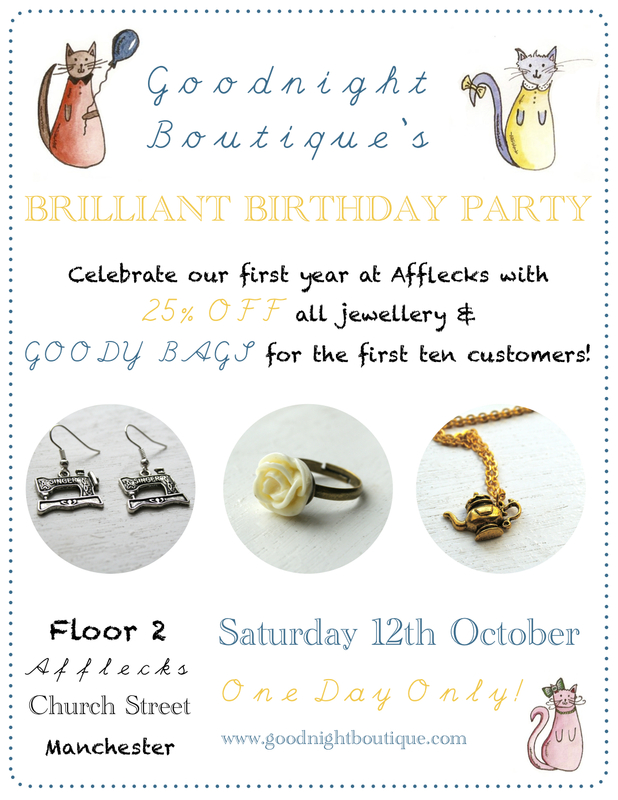 On Saturday 12th October Goodnight Boutique will be holding a Brilliant Birthday Party to celebrate our first full year open to business, on Floor 2, Afflecks! My little shop opened for the first time on 8th October 2012 and it’s been a challenging and exciting year. Thank you to everyone that’s been to visit, shopped, browsed, or helped out over the past 12 months! On October 12th we’re holding a 25% off sale on ALL jewellery and also giving out FREE goody bags to the first ten customers! Make sure you pop in. We’ll be running a little promotion in the Etsy shop too, so keep your eyes open for that too! ← New! Great & Small Personalised Christmas Prints! I remember buying my first pair of doc martins and a second hand pair of jeans at Afflecks Palace back in the 90’s as a student. It was a really happening place then. Is it still the same?